I love this saying! In a world where everyone takes everything so personal and has their negative input against this or that, how amazing of a reminder it is to see that it’s okay for us to still feel positive about where we are. I constantly find myself in this internal conflict of whether or not to be consumed by those who are negative, as opposed to staying where I want to be- the positive side. Help me out here, but how many of you can think of one or two people in your life who are always negative? Whether they complain about every day things, gossip about others or tear others down or give their viewpoint about something, but it always seems to have a rain cloud over it. Isn’t it draining?? I interact with people like this at random, and those moments with them (and usually moments following) I feel so overwhelmed and drained. How can someone feel like that all the time? I imagine it’s difficult, and viewing the world where it’s always raining has to steam from more pain than I’m aware of. I just hate the effect I down times allow it to have on me. A friend of mine from high school wrote on his senior picture to me “Aurora, don’t let the world change who you are.” And this has always stuck with me as I navigate negative situations as they arise. It’s so important to remain who you are, even when faced with something you feel it’s easy to fall into. The world is a beautiful place… and my little itty bitty blog will always serve as the constant reminder of that. We all are entitled to our bad days (trust me… I’ve had a dozen or two), but I think it’s always important to remember life is good. Being alive is good… and the only person who impacts that viewpoint is you. I’ve been hanging on to this quote for a long time… and I think it’s because it makes so much sense and is probably applicable for so many people. It is so easy to fall into the relationship you’re in and to slowly find yourself being defined by it. Whether it’s spending every moment with that person, living with them, or finding yourself only being with them 98% of the time… You no longer act/view yourself as 1… But rather 2. I think too many times when our girlfriends (or guy friends) fall into this realm, it’s so easy to cast them as the friend who got away or the one who got a boyfriend/girlfriend and disappeared. I don’t always think this is the case. All people want love. We all want love. When you find the person worth that much of your time and the one you want to be with, you deserve to take that time. 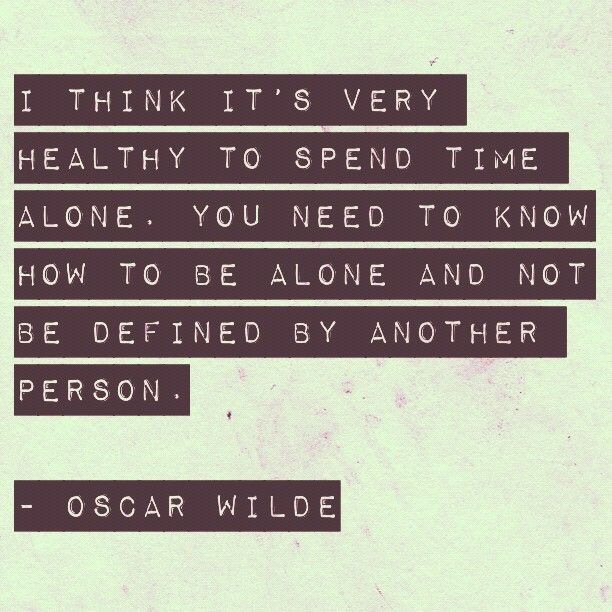 Throughout my entire relationship, (even up to and including my engagement), I have always made it a point to find time for myself. Call it “me time” or “girls night out,” but that time away is essential. As a woman I know I need it, but it’s also important for all women I know to want it too. This topic resonates with me because I know what it’s like to feel defined by another and unsure if you’re capable of standing on your own two feet. The truth is, you can never be happy with others if you’re not happy with yourself… and if you can’t stand on your own. This is a truth that I know in time I had to think about myself. The answer is balance. How do you find this? I think that over a period of time, I felt confident enough in what I offered as a person, to feel secure in most areas of my life. This takes time, practice and understanding that sometimes you have to walk without the safety net to know you are safe. In the picture perfect world- you end up with who you want and live happily ever after- the more difficult part of this is making sure you’re confident in who you are first!